The new year of the Julian-Gregorian calendar is just around the corner. According to the Pantone Color System folk "Blue Iris" is the official color for 2008. Yippee, I am rather partial to the color myself. The website states that the color is a perfect balance between blue and purple providing reassurance with a hint of the mystery and excitement. In the aromatic sphere the color purple is related to the spice notes and the color indigo is associated with herbaceous/camphoraceous notes. Thus, a perfume relating to the color Blue Iris might have these notes, as well as some Orris Root, the extract of Iris root. Read more about aromatics and color by clicking here. Numerologically 2+0+0+8 = 10 which translates to a number 1 year. The number one represents new beginnings and initiative. A great time for pioneering and putting forth new ideas. The second phase of our website will debut in 2008 along with several new perfumes. It is the year that Illuminated Perfume formally enters the world of perfume. I intend that 2008, as a year of new beginnings, marks the entrance of botanical perfume into main stream consciousness, thus assisting greater awareness to our impact on the planets resources. 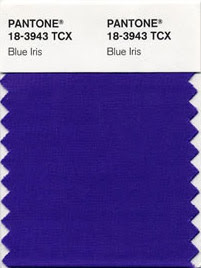 Image above, swatch of Blue Iris from the Pantone website.